The wife of Premier and Minister of Finance, Dr The Honourable D. Orlando Smith (AL), further explained that the VI has not received UK grant-in-aid since 1976 and this decision will essentially push us back to pre-1976. “It is absolutely wrong. It robs us of our dignity. 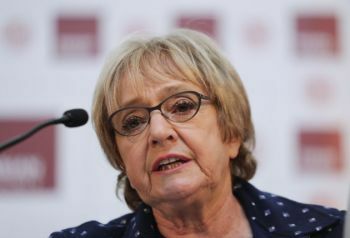 It robs us of our self-respect at a time when we are down, but after 40 years to have to go back cap in hand to go to the UK to be asking them to support us, it is untenable,” she emphasised. Mrs Smith was at the time a guest on the Stay Woke show with Zoe J. Walcott-McMillan, aired on Saturday May 12, 2018 on ZBVI 780 AM and live streamed on the Ms Walcott-McMillan’s Facebook page. Also on the show was Ayana S. Hull, Author of the book 'Financial Services Demystified', Lawyer, co-writer and composer of the Territorial Song and member of the organising committee of the national march scheduled for May 24, 2018. The executive director further explained that the Virgin Islands (VI) signed an entrustment letter with the United Kingdom (UK) that says if anything of significance of this nature should happen there should be widespread consultation, but pointed out that there was no consultation at all before the decision was made. “There has never been that type of consultation. So it is wrong and it is a constitutional overreach and that is why we have to protest,” while noting that the government is working and looking at every possibility to make sure that the situation remains the same if the decision does not become a global standard. Meanwhile, Mrs Smith indicated that the decision will not just impact the territory’s financial services sector but it will impact the “world economy”. While drumming up support for the march, Mrs Smith noted that it is not about just one person but that one person had the idea and then it became a movement, adding that the march will be more effective if the other Overseas Territories show their support. "As I have been always saying from day one, this march is going to be impactful. It has to have a lot of people joining in, the country has to join in. What will make it even more effective is if you have the support from the other Overseas Territories because it is not just the BVI that has been impacted but certainly all the OTs and it will have that much more impact if they were to become involved." The march gonna do a damn thing. This is the same UK Empire that they always were and doing things they've always been doing. We just thought their words meant something that it didn't. They will never allow us to compete equally with them. Margaret Hodge is full of crap. Who has more dirt on their hands than them ? They have murders of innocent people on their hands, colonialism, capitalism, racism, money laundering, and down right dirty politics. They have brutally enslaved our people and made us build their structures on our backs from free labor. Now they want to kick us out of Europe after we have been there for generations, saying our paper work was not straight, when they themselves made the paper work and knew they were going to do this to us again. Our First Lady Lorna Smith was right and glad she went their and told Margaret’s rass off. The UK is trying to bankrupt us by killing 80% of our income, then gave us a loan to pay back, knowing they are destroying our economy. I for one am not fooled by them at all and we should be able to go to the United Nations and sue them. She is supposed to be our mother country? What kind of mother treats her child this wavy unless they are brain damaged and don’t know better? Sick of them! The consultation was intended for our local government to consult with us on legislative matters, which up to this day never happens. We get 1st, 2nd and 3rd readings in one sitting of the house of assembly without one town hall meeting with the public. Is the UK watching? Yes. We the Virgin Islanders want transparency, accountability, good governance and most of all the appearance and reality of justice for all. Ndp robbed us of our dignity. Never heard a corrupt set whine over money so well sah. Calm down lorny. What dignity is there to rob in a land where cronyism and corruption rule and where there is zero accountability? Is the BVI prepared to walk away from the $ 300 million loan guarantee from the UK? You mean the UK of course with your references to cronyism and corruption. What happened to planning for the worst, hey ---best case is we keep every things as is( perfect life goes on), but what if they decide to crush 60+% of our economy. What options are available to us-Legal steps, develop other industry, independence What....for years this govt spoke about the risk being pose to us but it seem like they have no back up plans. Undoubtedly, financial services is a core component of the BVI economic base and its decline would adversely impact government delivery of services, along with standard of living and quality of life of residents. However, its contribution should have been anticipated. The territory, along with some other OTs, have been labeled as tax havens by developed countries, reducing the national income of these countries. Faced with revenue reductions, these countries will take the necessary action(s) to stop the revenue loss. The register of beneficial ownership will benefit the UK and cause a loss for the BVI. As such, what action should the BVI take? IMO, the scorched earth approach is not the most probable action. The ready-fire-aim approach is also not an effective action. Effective diplomacy should be employed to try to achieve the desired outcome. Marches occur for several reasons 1)to demonstrate populace disdain for an issue, 2) to highlight an issue, 3)force an entity to reverse some course, 4) force an entity go in a different direction than planned......etc. If the UK does not meet the BVI demand, what leverage does it have? Sorry, the First Lady has no room to bring up the subject of dignity, BVI Customs, Immigration and Labour are the worst offenders of dignity violations on the planet, take a casual walk down past those departments to see the relevance. Perhaps a little of what the BVI dishes out might exercise people's minds. Go to hell Cromwell. You darn ingrate. Clearly you are a minority, perhaps you should think that through.